This is a detail of some of the decorations on the edible work of art served at Kasma's party. 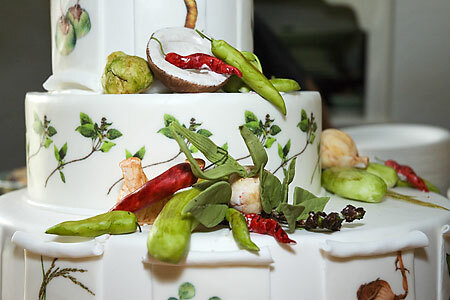 The drawings decorating the outside of the cake reproduce illustrations found in Kasma's first book – It Rains Fishes: Legends, Traditions and the Joys of Thai Cooking. The cake was baked by Julie Durkee of Torino Baking. It was a white cake with a buttercream and berry filling and was quite delicious.